Graham works full-time in the store and instructs in our canoe, kayak and SUP programs. He has administered the instructional program, been the assistant buyer, and is now our store manager. 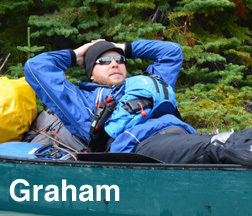 Graham used to work for the Kids Cancer Care Foundation’s Camp Kindle, where he ran a variety of outdoor programs. That is where he discovered his passion for the outdoors and outdoor leadership, and it was the driving force behind his returning to school for Ecotourism and Outdoor Leadership at Mount Royal University. During his first year in ETOL he discovered his love for paddle sports (canoeing and kayaking). During Graham’s time at Undercurrents he has become known for sharing his knowledge and passion with all who will listen. Paddle Canada Moving Water Canoe instructor.